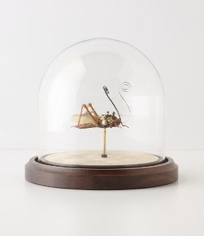 For example, did you know you could buy a real grasshopper in a glass globe for a mere $1298? 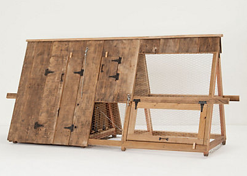 Bet you didn’t know you could buy a $3000 chicken coop from Anthropologie. 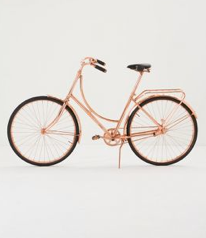 How about a copper bicycle for $6000? 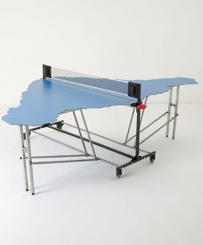 If you have a larger budget, say $12,000, why not invest in an Easter Island shaped Ping Pong Table ? * My mom is always exhorting me to not buy “junks.” I admit I do buy junks, but not junks like this! A couple years ago my parents returned to their country, and by “their country” I mean America. My parents were both born and raised in Korea. Their first experience with Americans was the arrival of soldiers in World War II and during the Korean War. They both remember with deep and abiding gratitude the great sacrifices of American GIs who came to fight for them. They also remember their simple kindnesses. My dad still talks about how a GI handed him a chocolate bar. It was the first time he tasted chocolate. He promptly threw up, but still remembers the gesture with fondness. The idea that he might pursue an American education was first suggested to him by a soldier, who offered to sponsor him to come to the United States to study. For someone who wanted nothing more than to read and learn and who had struggled so hard to get an education, this was a tantalizing and almost impossibly beautiful dream. For both my parents, coming to America was as much about going towards a brighter future as it was about leaving a painful chapter of their lives behind. My dad first came to America as a student in the early 60s and he brought my mother over shortly afterwards. They chose America as their country when they became naturalized citizens and have been proud to call themselves Americans ever since. They love America, unabashedly and wholeheartedly. This has manifested itself in many ways over the years…My dad only bought American cars, even back in the days when American cars were terrible. My dad’s a scholar, not a fighter, but out of a sense of patriotism to his adopted country, he tried to enlist in the army to fight in Vietnam. To his sorrow, the recruiters told him he was too old. Once he tried unsuccessfully to return his tax refund to express his gratitude to the country that had done so much for him. My parents always extolled the virtues of American democracy, the American educational system, American culture and society. They’ve always been quick to praise their country, loathe to criticize it any way. At times I’ve felt like this was more their country than my own, even though I was born and raised here. Thanks to my patriotic parents, I’ve attended schools and have hung out with people who have tended to regard patriotism with suspicion – as something corny and anachronistic. I think it was only when I began to travel abroad that I realized how very much I do appreciate this country and how much there is to love about it. After spending the majority of their lives in America, my parents felt compelled by a sense of filial piety to return to Korea. Every year they would promise to return to the States after “just one more year,” but they always ended up extending their stay in Korea. What was only meant to be a year in Korea ended up being a dozen years. Finally, a couple years ago they came back home to America for good. They had been living in a high-rise apartment complex in the middle of Seoul and were delighted to have a patch of suburban lawn that they could transform into a garden. By then my mother, who had been the visionary behind their last beautiful American garden, was too sick to do the work required to translate her vision into reality. But my dad, who was always a farm boy at heart, could hardly wait to roll up his sleeves and till the soil. He had barely recovered from jet lag when he sent a check for over $500 to a mail order nursery for dozens of plants. That’s a lot of money for retirees on a fixed income. It’s a lot of money, period. He eagerly, then anxiously waited and waited and waited for his plants to arrive. Finally, he asked me to contact the company. I called, emailed, called, hectored, emailed, pestered, called, over and over and over again to try to get the nursery to either send the plants or refund the money to my father. Finally, I contacted the Better Business Bureau and filed a complaint with the Office of the Attorney General for the State of Tennessee. That was two years ago, and I didn’t hear a word until this week when I got a call from the Consumer Affairs Office of Tennessee’s Better Business Bureau. To be honest, I had thought it was a lost cause. Whenever I would mention it to my parents, they would tell me the money was long gone and to forget about it. It rankled, but I eventually did manage to forget about it until this week’s phone call. It turns out that the nursery is still in business, but is being closely monitored by the state. Every month a portion of the money they make is appropriated by the state of Tennessee to pay back all past claims against the company. They’d been wading through over 300 claims filed from as far back as 2003. They’d gotten to around half of all the claims, and had finally reached the one I had filed on my dad’s behalf. Not “THAT’S America!” where a shady business can steal people’s money for years and years and still be allowed to operate. Not “THAT’S America,” where it takes two years to get your hard-earned money returned to you. But: “THAT’S America,” where nothing is impossible and where there are people hard at work making sure wrongs are eventually righted, and where there is a process to ensure that they are. That’s my parents’ America, and I’m glad to be living in it too. As you may have noticed if you’ve been reading along, I take my camera everywhere I go. So naturally, when I drove my mom to the Korean grocery store, I brought a camera to record some of the sights. If you haven’t already, please do look at yesterday’s post. I risked my life for those pictures! Everything was going swimmingly until we reached the housewares section. As I started taking pictures of the pretty and colorful dishes, an agitated ajumma* in an H Mart vest came scurrying towards me, chattering away like an angry squirrel. I don’t understand Korean, but I could tell that for some reason my picture-taking was making her nervous. I pretended not to notice and kept shooting away, but visions of a wrestling match in the aisles of H Mart were flitting dangerously in my head. From the corner of my eye, I could see my mother shuffling over in paaaaainfully slooooooow motion to join the fray. I was sure the ajumma was about to leap onto my back and take me down with a choke hold, when my mother finally intercepted her. Was my mom going to whack her with her cane? Was I going to be in a three-way rumble with this ajumma and my aged and venerable mother right there in the middle of the housewares aisle of H Mart? I kept expecting to hear the resounding “thwack” of my mom’s cane, but instead I heard her fend off the woman with a few words in Korean spoken in a mild tone of voice. Suddenly the murderous gleam in the ajumma‘s eyes died out. Her shoulders relaxed. She gazed upon me benignly, and…was I imagining it? perhaps pityingly? As we drove home, I asked my mom what she had said to disarm the ajumma. Tomorrow: why I almost got kicked out of the store and how my mother saved me from that ignominy! Last week’s x-ray on the left. This week’s x-ray on the right. And the “.25”? That’s for the quarter inch he grew since last week when he was measured at the doctor’s office and this week when he was measured again. (I know what you’re thinking, but I swear: it’s not the hair)! I was very confused. If anything, I’m probably the poorest of his four children. “But now your sister has you beat,” he concluded matter-of-factly. But in case you haven’t figured it out, what my dad was talking about was the fact that my sister hit the MegaMillions Korean Jackpot. Not only did she have triplets, she had triplet BOYS!!! To put this into perspective, my parents had three girls before they finally had their much-wished for boy. They named him Theodore, which means “gift from God.” They were lucky. There was a family in my father’s Korean congregation who had eight children, because the first seven were girls. Not only does she win national awards, she also wins every breath-holding contest too! Tatiana adores her only other girl cousin. Nerding out with the iPod. Wendy and I have been friends for (gulp!) 30 years. We became friends in high school, but became even closer after we graduated. This is somewhat surprising, because if you were to create a Venn diagram of our friendship, there would be very little that would go into that part in the middle where the two circles overlap. For example, Wendy loves the outdoors and hiking. I love the indoors and sitting on my couch. Once I ventured one little toe into her side of the Venn diagram when I went for a walk with her in Great Falls Park. Anyone who knows me will understand what a huge stretch that was for me. And how much I’d really have to like someone to go into the woods with them without being blindfolded and having a gun pointed to the back of my head. Wendy is a kindergarten teacher, which puts her right up on a pedestal with the other two categories of people I revere: nurses and social workers. She teaches in a school with a population predominantly made up of recent immigrants. 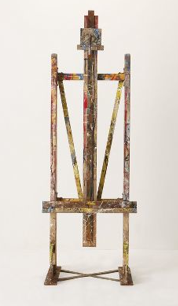 In my book, that puts her on an extra little shelf right at the top of that pedestal. She does so much for others every single day that I can’t write about, because it would embarrass her. Suffice it to say, I think the world of her. 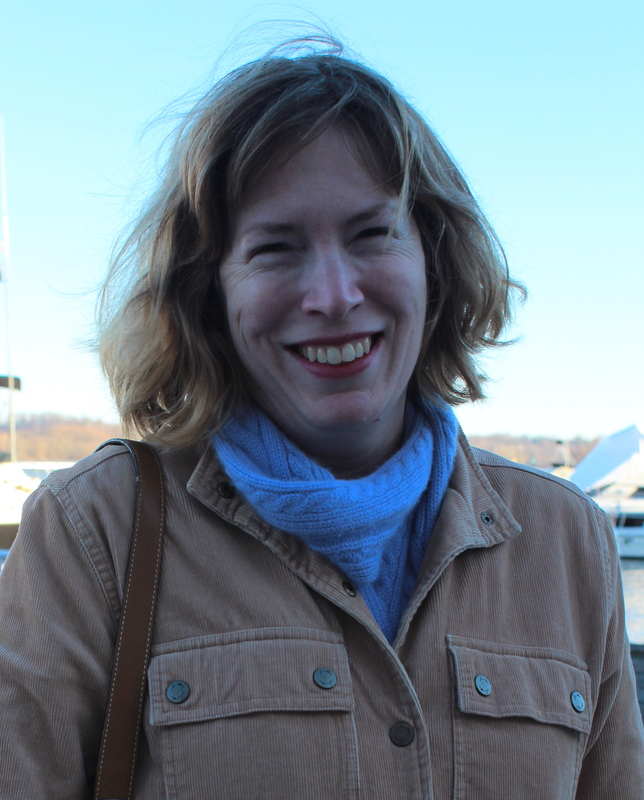 The Torpedo Factory is located right on the waterfront in Old Town Alexandria. It used to be – (surprisingly enough!) – a torpedo factory from 1918-1923. After that it served as a munitions storage facility. In 1975 it was transformed into an art center with three levels of open studios and galleries. There’s something quite delightful about a factory for producing weapons evolving into a space where art is created instead. You can wander through the studios and watch artists at work. They’re usually very happy to answer questions or talk about their art. 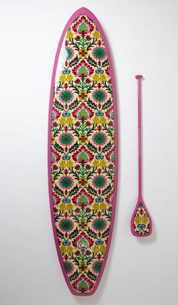 Every inch of the interior is devoted to art. There is a papier mâché pachyderm perched on a ledge, friezes decorating the outside of the curved stairwell, and under the staircase in one of the treads is a lighted ledge which houses an array of miniature sculptures. If you’re feeling inspired, you can sign up for one of many Art League classes. Finally, you can cap off a lovely art-filled afternoon with a bite to eat at the Bread & Chocolate café. My kids got a little too jacked up on bread and chocolate and were overly boisterous on the way back to Arlington. Wendy and I were right in the middle of a serious conversation when I finally snapped and pulled the car over to squawk at the kids in a completely undignified manner. If I had witnessed this fit of apoplexy, I’m sure I would have snickered. But remember, Wendy is a kind person. She politely pretended that it was perfectly normal to threaten your kids that they would have to hoof it back to Arlington if you so much as heard another peep from them. As soon as I was done snarling at them and had pulled back onto the road, she picked up the thread of our conversation as if nothing had even happened. That’s my Friendy Wendy.